As someone who has travelled interstate and overseas, I’d say we’re fairly lucky to live in Adelaide because we have access to the best quality produce and live in a multicultural society where different cuisines are right at our doorstep. When it comes to Filipino cuisine, I must say I haven’t really been properly exposed to it. Yes, I’ve had a lot of Filipino street food, but to me, that’s only part of the experience. 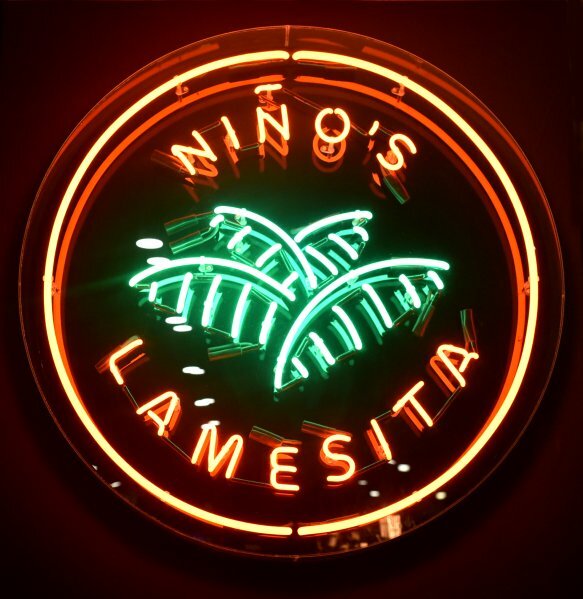 With the opening of Nino’s Lamasita, that’s all about to change. 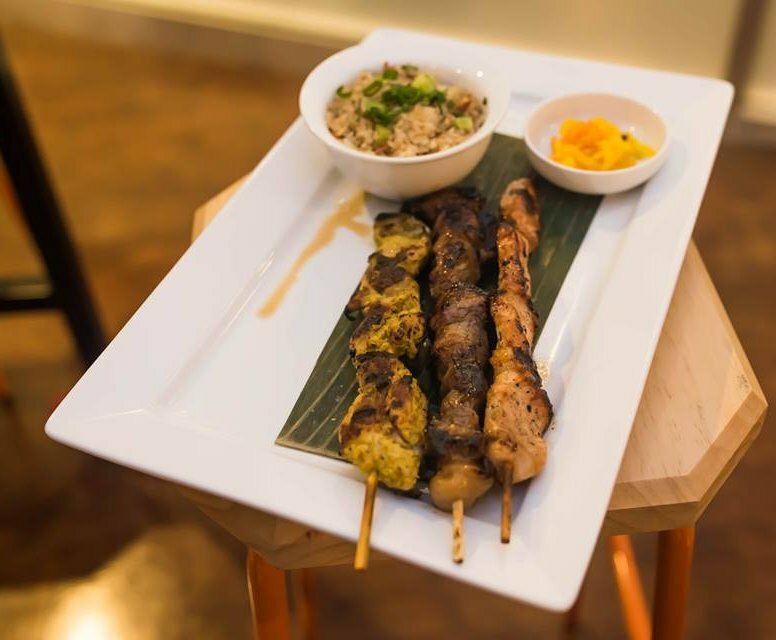 The people of Adelaide will now get to discover what Filipino food is really all about. For those who are not familiar with Filipino cuisine, it’s often described as the original fusion with influences from Japan, China, Spain, Malaysia and other neighbouring countries. While typical Filipino dishes can be heavy, the food on offer is more of a modern adaptation. The kitchen is run by a chef of 37 years, who is part of the team that creates traditional dishes which are lighter and fresher while not skimping on the taste. Adelaide Food Central was invited to sample some of the dishes tonight. All food and drink were provided free of charge. To start off with, we had the Pork Sisig which is like the Filipino version of San Choy Bow. It’s twice cooked crispy pork belly with red onions mixed with kalamansi, white vinegar, chilli and peppercorns served on a bed of lettuce. 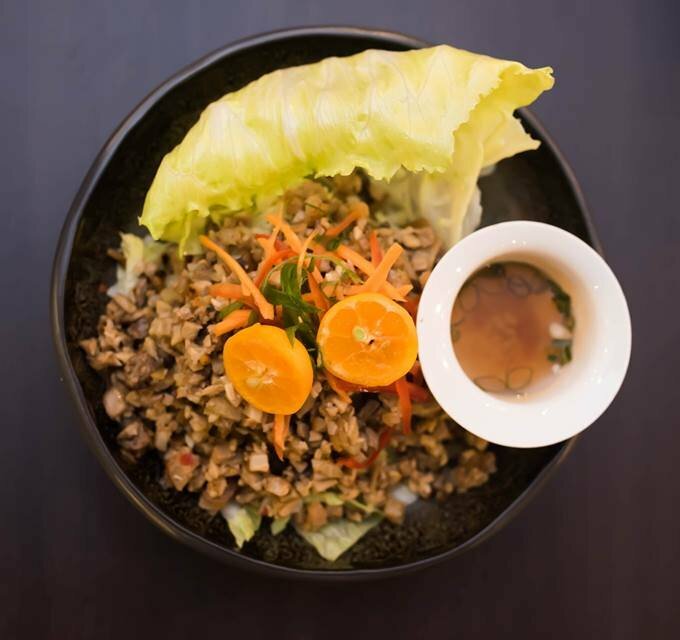 The pork was well seasoned, the dressing very light, and the lettuce leaf, fresh and crisp. 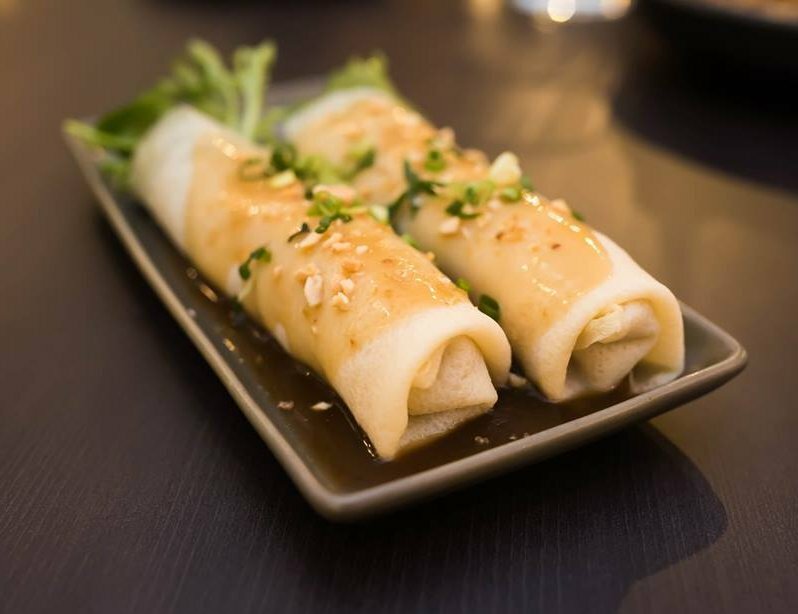 The Lumpiang Sariwa are Filipino style fresh rolls with a texture very similar to a pancake. These were filled with sweet potato, carrots, cabbage, jicama, fried tofu strips and green beans topped with house made lumpia sauce and roasted crushed peanuts and garlic. I thought the best parts of this dish were the freshness of the ingredients and the contrast in textures. 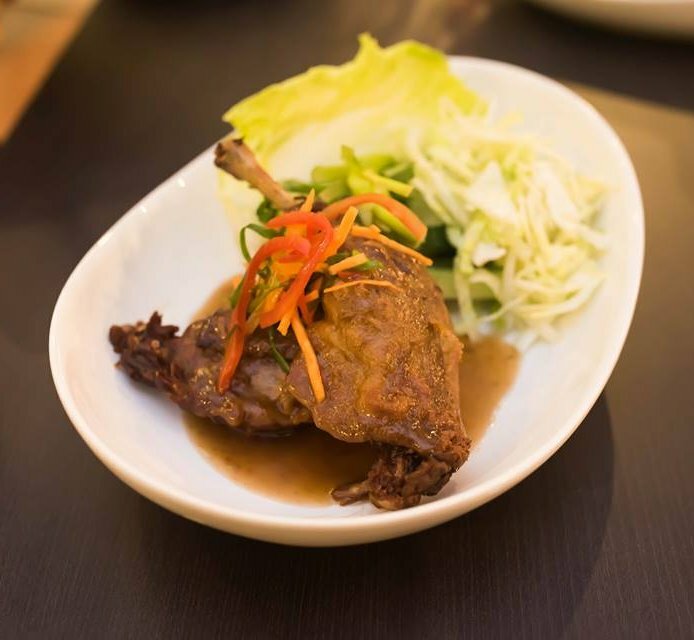 For my main, I ordered the Double Duck Leg which is duck that has been cooked in Asian spices. I thought this dish was simply amazing. The skin was nice and crisp, and the meat was tender and succulent. The sauce that it came with was thick in consistency and full of flavour. It was an outstanding dish. My friend ordered the Kare Kare which is braised ox tail with eggplant, pechay and snake beans. 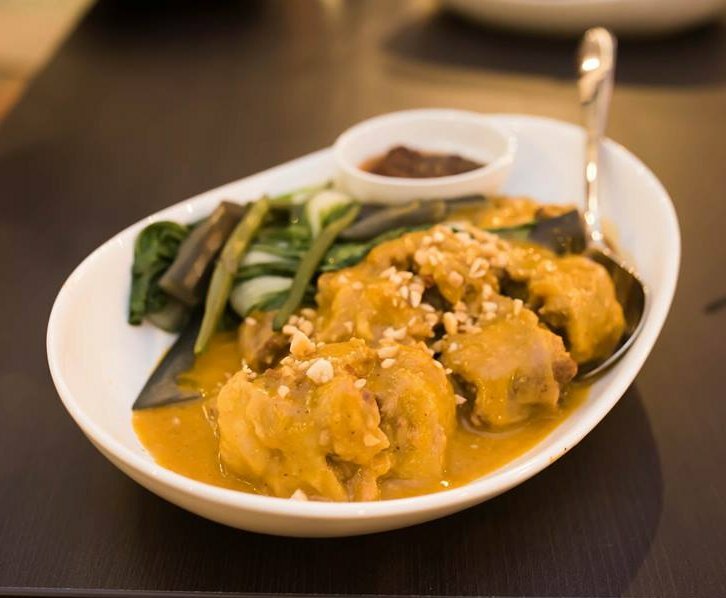 The ox tail has been slow cooked in a peanut sauce and served with sauteed shrimp paste. I’m personally not a fan of ox tail in any form but I thought this dish was alright. The meat was tender and succulent, and the flavours very complex. 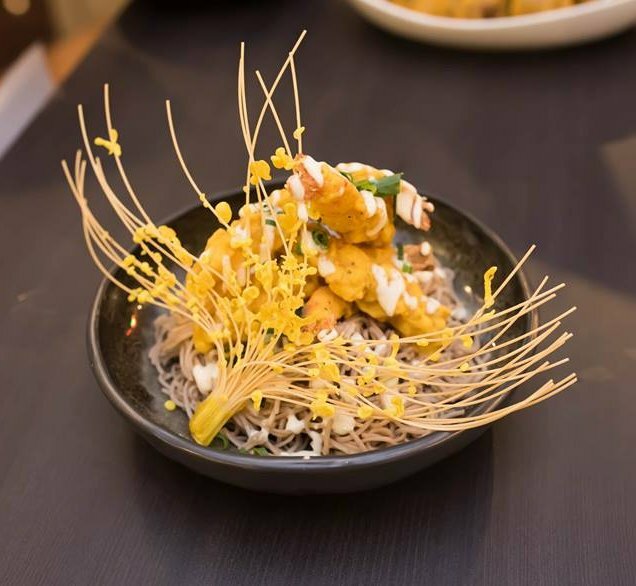 Another friend ordered the Camaron Rebusado which is lightly battered king prawns served on a bed of soba noodles with wasabi mayonnaise. The prawns were lightly coated, and the meat was juicy and succulent. The wasabi mayonnaise wasn’t overpowering and it brought all the elements together quite well. We also ordered one of each of the Barbecue Skewers; Lola’s Grilled Chicken, Korean BBQ Style Beef and Pinoy BBQ Pork. Prying the meat off the skewers proved to be a bit difficult, but once we got past that, the result was rewarding. Each protein was well marinated and juicy with lovely smokey barbecue flavours. The accompanying Filipino fried rice was also very good. 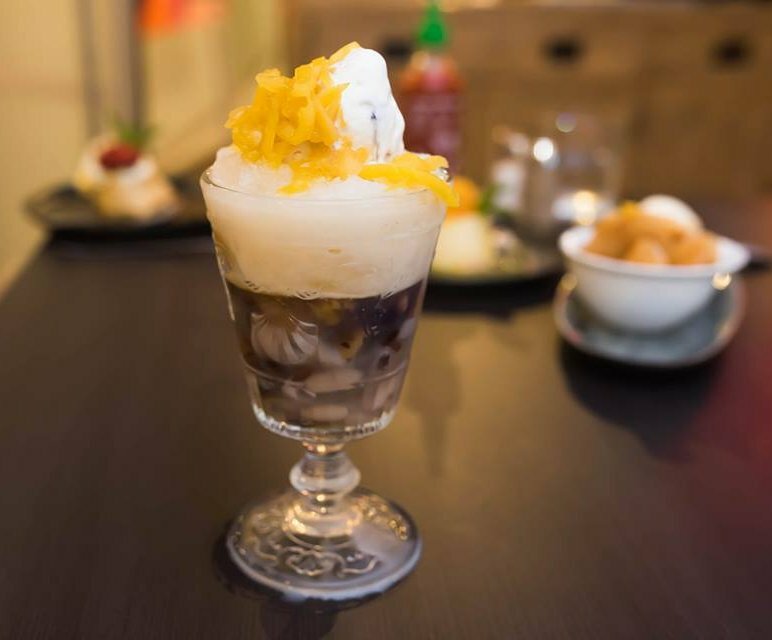 When it came to dessert, we ordered the classic Filipino Halo Halo. This has the look and feel of an Asian dessert and contains bananas, sweet potato, sweet red beans, coconut, palm seeds, purple yam, shaved ice, evaporated milk, house made leche flan and ube flavoured ice cream. With a full encyclopedia of ingredients which have different levels of sweetness and textures, this is a dessert that grows on you and becomes incredibly addictive. I’d have no problems ordering this one again. 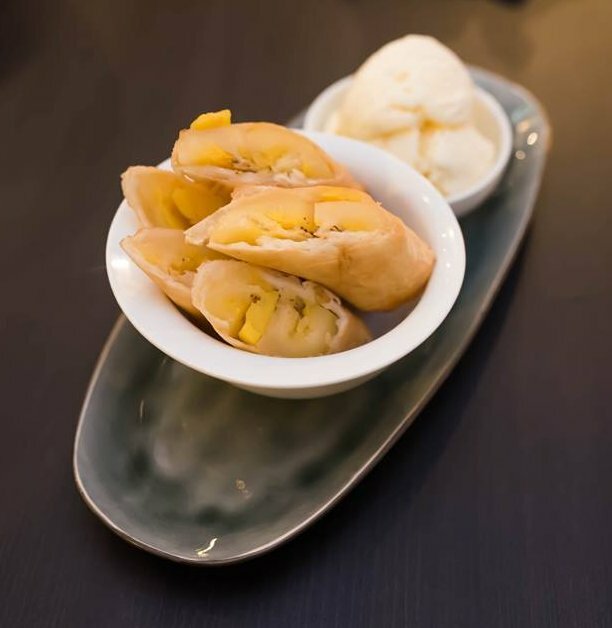 The Turon Surprise are bananas and jackfruit wrapped in spring roll pastry. To me, it’s the healthy variation of the chocolate spring roll. The natural sweetness of the banana and jackfruit were well complimented by the ice cream. 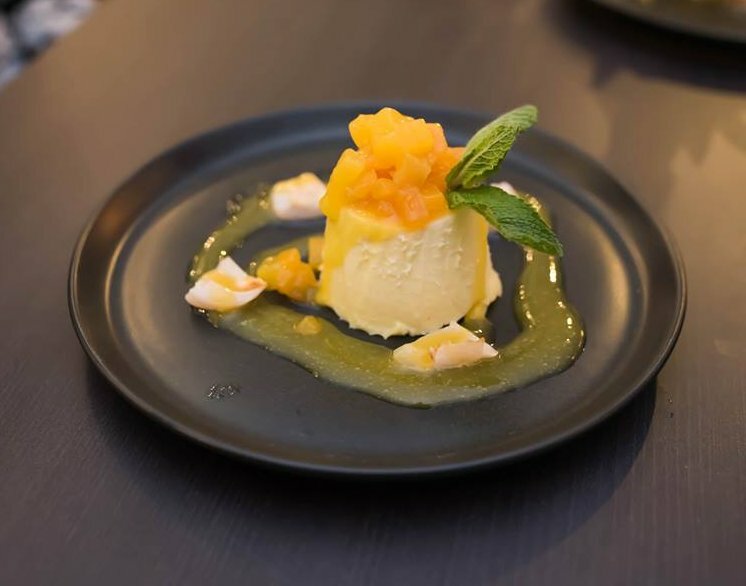 The Mamon De Leche is a duo of vanilla and kalamansi creme caramel baked with chiffon cake. I actually quite liked this dessert. The soft, delicate sponge cake worked well with the smooth, creamy creme caramel. The last dessert was the Panacotta. It came with vanilla, lychee and mango coulis. The panacotta was perfectly executed and was light, and subtle in sweetness. Mixed with the coulis and it was a match made in heaven. Having experienced a proper Filipino meal, all I can say is WOW! Every dish tonight was well presented, well executed and very tasty. Combine that with the friendly staff, the casual and relaxed atmosphere, and reasonable pricing, and this place is sure to be a winner. 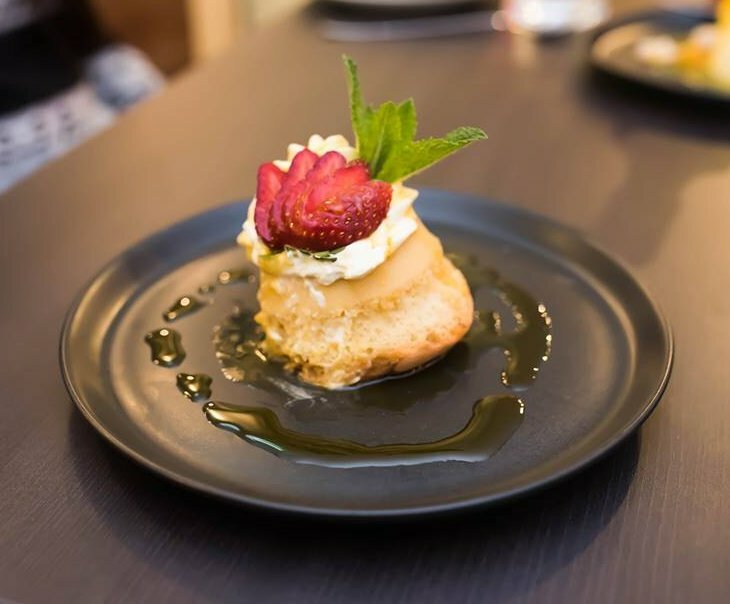 While Filipino food is slowly gaining momentum in Adelaide, Nino’s Lamesita will certainly give all their competitors a run for their money.